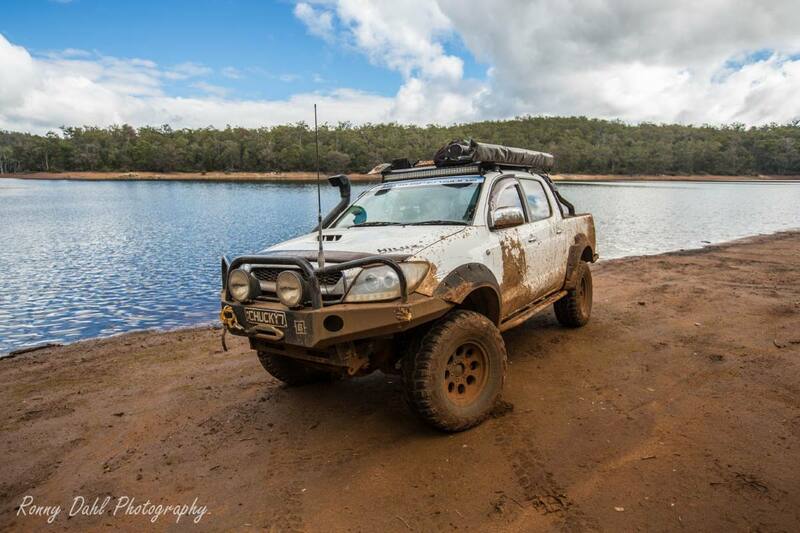 This is one awesome looking and well thought out D4D Hilux. 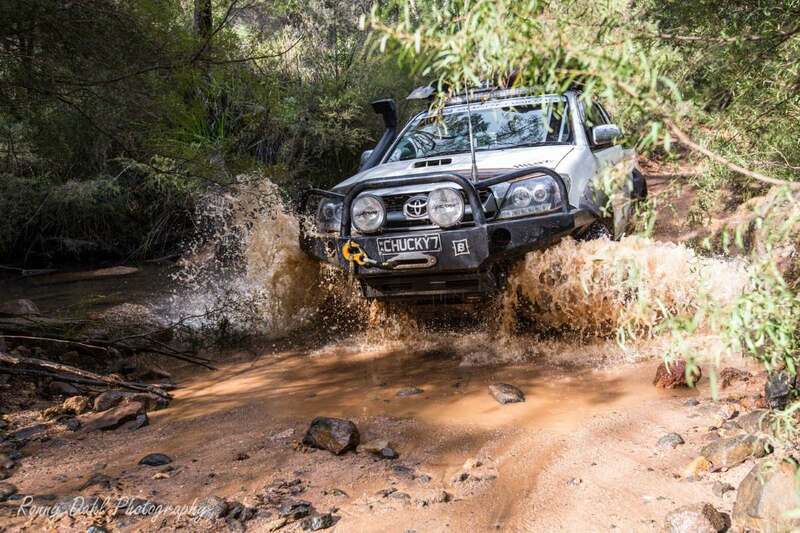 Of course having owned a highly modified Hilux myself I got a bit home sick while checking out Brad’s rig. 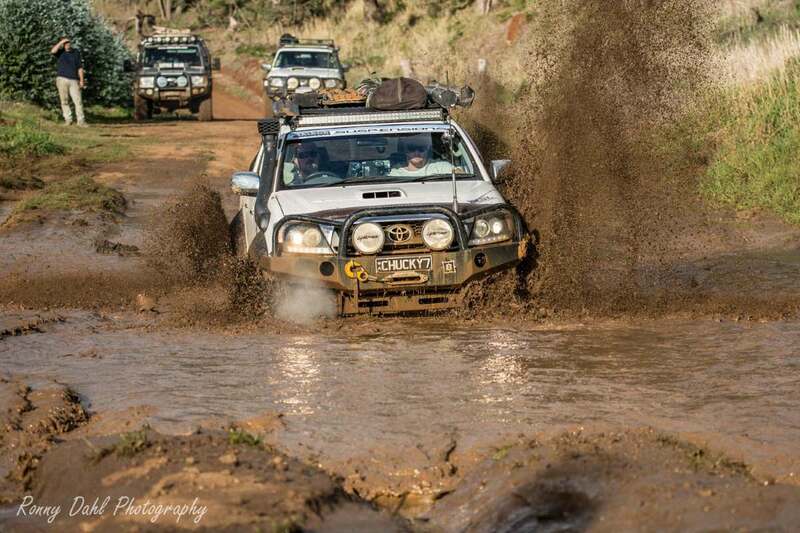 Brad (AKA Chucky) joined us on one of our adventure trips in the Brunswick area and really showed us what his D4D Hilux was capable of, not much stopped it apart from some deep sloppy mud covered ruts but these would have stopped most vehicles. Looking through Chucky’s Toyota Hilux it was clear it has been a carefully thought out build and he is still not done yet! 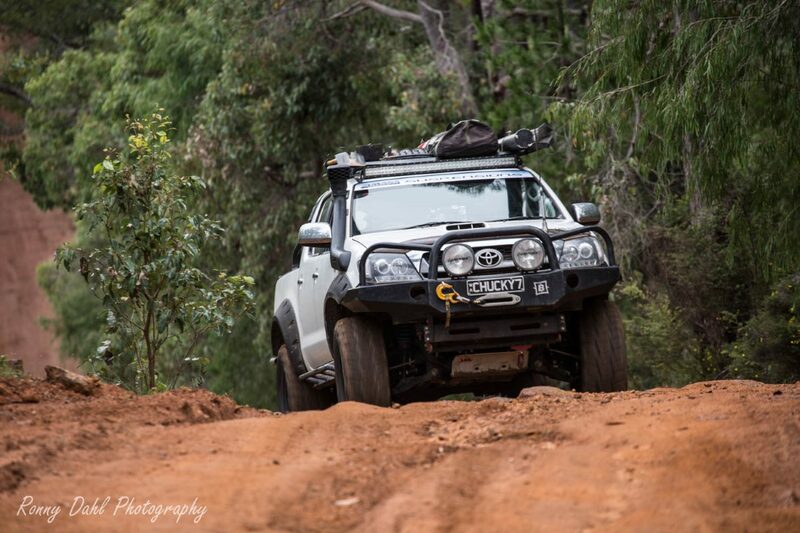 He has been off-roading for quite some time and has done everything from tough tracks to long touring and everyone who has do as much as him would know that tweaking and modding parts of the vehicle will never end… there is always room for improvement and Brad had big plans for a custom tray on the rear of his SR5 Hilux. 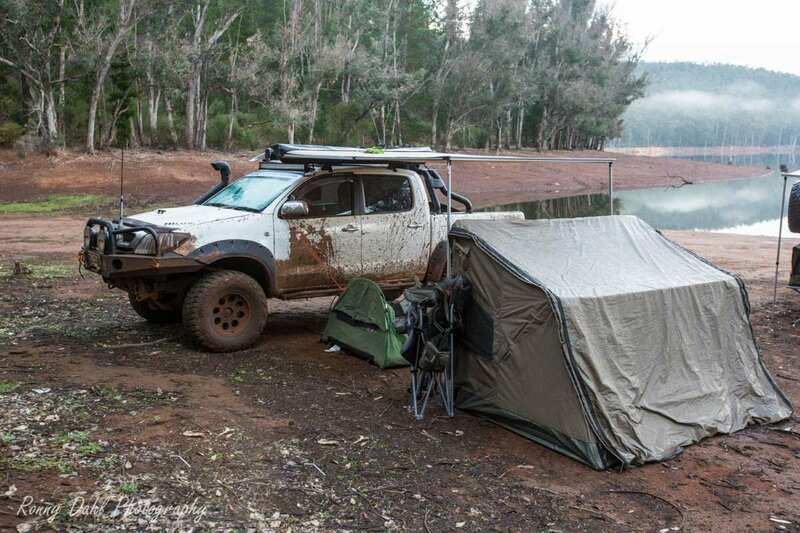 Here is what Chucky has done to his D4D Hilux and his advice when it comes to improving your Hilux. GTurbo Badboy 27psi, Front mount Intercooler, Modified Injector Pump + Fuel System, 3 inch straight through Exhaust, Unichip Q+, Unichip Accelerator Booster, Fuel/water separator, HPD catch can. Extras Bonnet/Hood Strut kit. Front and rear ARB Diff Lockers, Custom HD Clutch, Diff breathers, transfer case and gear box breathers. Dual batteries with Redarc isolator. Lightforce Genesis 50Watt HID’s, 40 inch dual row curved light bar, 15 inch LED bar on the rear. GME 80ch UHF with front mounted GME antenna, GME handheld UHF, IPad mini with Hema maps. Dobinson Remote reservoir shocks, HD Front coils 4 inch lift front, Reset rear leafs 2inch lift rear, Monster rides Bump-stops, Monster rides front diff relocation kit (brackets). 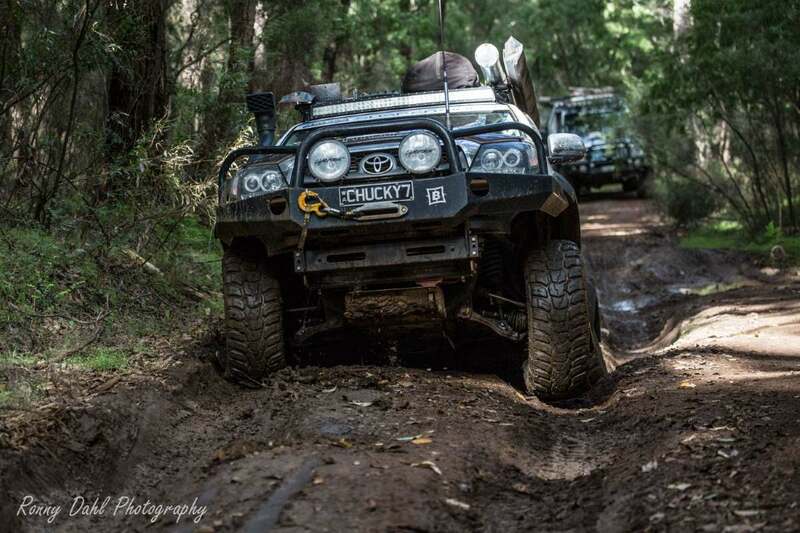 Buds Customs Winch Bar, Buds Customs Rock Sliders, Rear Tub Quarter Chop with Custom Rear Bar, Jungle Flares front and rear, ARB Bash Plates, Custom flat Roof-rack with awning, Fishing rod holder, High lift jack, Maxtrax and Shovel. 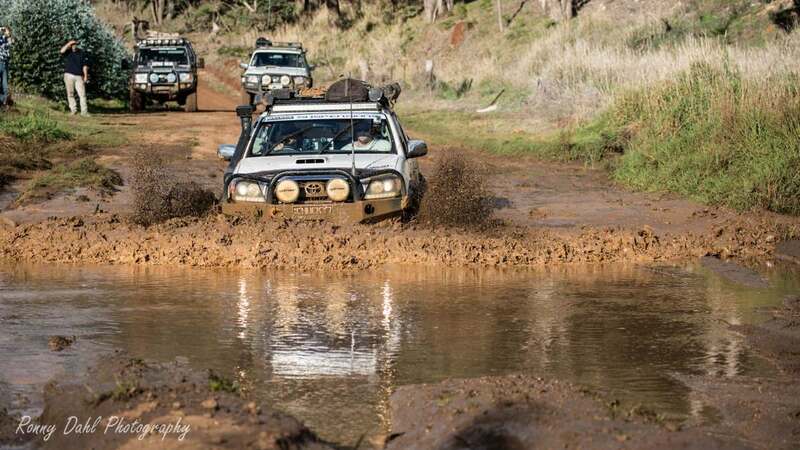 Safari Snorkel. Open tub, future custom tray coming. Outback Roof console, Auto metre Boost + EGT Gauges fixed in Pillar pod & Black Duck seat covers. Mean Mother Edge series Winch 9500lb with Dynema rope, Full winch and snatching recovery kit including spare shackles. Video of Brad's modified Hilux. Callcup Hill, towed another Lux (Hilux) up Callcup with rooster tails off all 4 wheels. 1. CVS: With lifts 3 inch and more a good diff drop is required to correct CV angles. 2. Lifts: any higher than 4 inch and you will be limiting up travel, will look cool but won’t work well off-road. 3. CVS & Rack ends: Keep spares of each of these as they’re the first to go with hard wheeling. 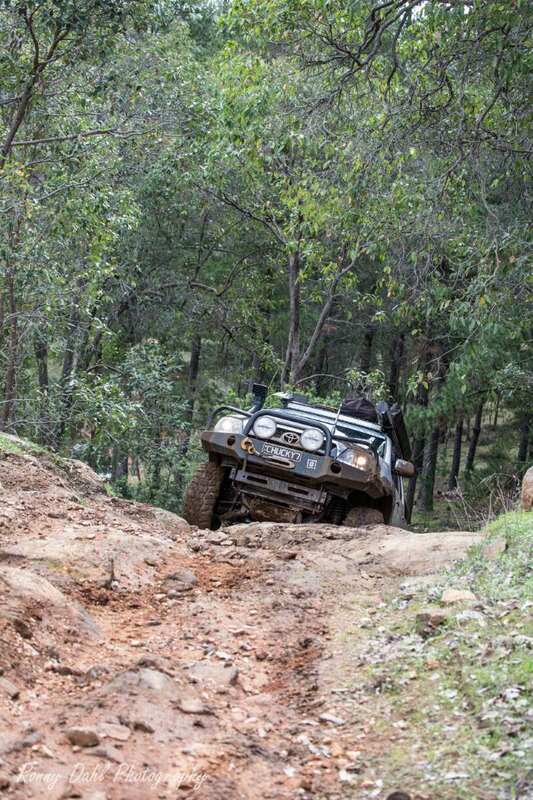 Thanks to Malaga Suspensions (Colin) for getting the suspension sorted and working great on and off-road. Peter at PJM Performance for all the engine mods and servicing. 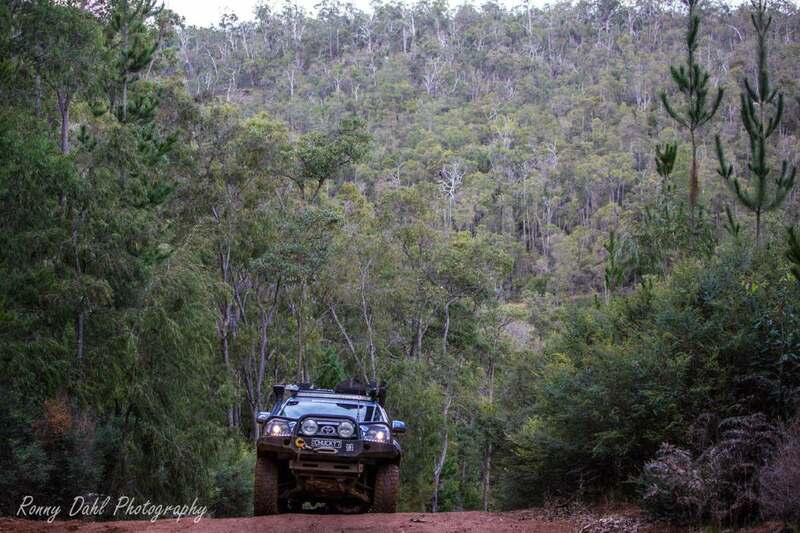 Leave D4D Hilux And Go 4 Wheeling In Western Australia.